Check out our new video here with everything you need to know to start practicing it with us. Posture: Interlock the index fingers, also called the Jupiter fingers, at the middle segment. The left index finger hooks down over the right. The right index finger hooks horizontally with the left. Bring the mudra to the Heart Center (the center of the chest) with the arms parallel to the ground. If you hold the hands too low, it will cause a depression. Keep the spine straight.Variation: you may also hold the mudra at the level of the Brow Point (between the eyebrows). Breath: Make the lips round, as if you were drinking water. Then breathe deeply through the mouth. Exhale through the nose. Breathe in like you are breathing in prosperity, like you are drinking water. Drink the prana (breath of life) through the mouth and exhale through the nose. Eyes: Fix your eyes at the tip of the nose. Totally relax your face. Mantra: Listen deeply to the "Har Har Har Har Gobinday" mantra chanted by Nirinjan Kaur while you keep the breath going. This sound of the breath and the mantra guarantees prosperity. 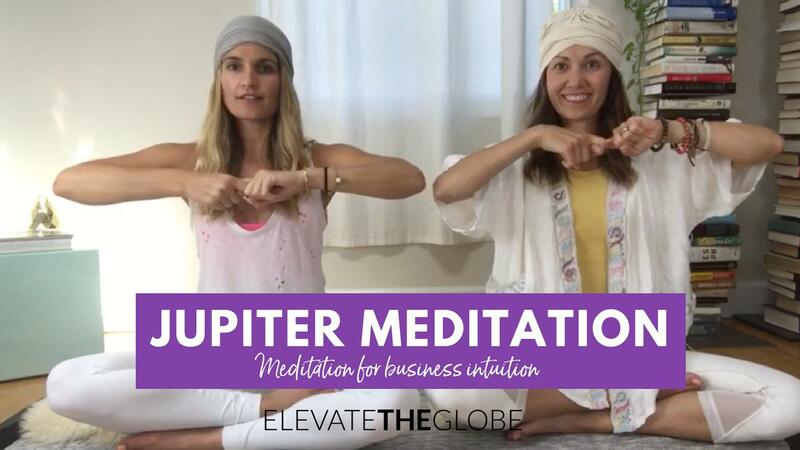 Posture: Keeping the Jupiter (index) fingers interlocked, raise the arms and hold the mudra over the head. Eyes: Keep the eyes focused at the tip of the nose. Breath: Same as in Part 1. Mantra: Same as Part 1. This posture is done to establish brain strength. It will strengthen the grey matter. It creates a halo around your forehead — a sign of good luck. Posture: Keeping the Jupiter fingers interlocked, lower the arms and hold the mudra at the Navel Center. Comments: Jupiter is the Lord of Knowledge. By holding the fingers in the Jupiter lock, you will invoke the Jupiter guidance. By looking at the tip of your nose, you will control your mind to achieve it. By breathing a full breath inside the pranic energy, you will bring the result home. By the sound current, you will change the neurons of the brain to set a pattern of success. There is a subliminal, computerized permutation and combination in the sound of the mantra to assure prosperity. If you are doing this meditation for 31 minutes, continue Part 1 for 24 minutes. If you are doing this meditation for 62 minutes, continue Part 1 for 55 minutes. In 3 minutes, it will start breaking the blocks. Yawn or sneeze, don’t interfere with body language. You have tensions of years and years. Let that go. After approximately 11 minutes, the thought patterns in your head should start to change and your body should start to relax. With those tensions gone, you will start finding new horizons. About 15 minutes into the meditation, certain things which have been blocking you will start to tremble as blocked energy is released. After approximately 22 minutes, you will start to face your mental blocks, which need your perfect attention. Keep the breath strong and full as the fight starts between you and your mind. Cassandra Bodzak helps women all over the world make peace with their body, quiet their mind, and reconnect with the..